If you're reading this, you probably have an email address (or two, or three ...). In fact, you've probably been sending and receiving emails for years, and you've definitely received some questionable deliveries in your inbox. Whether they were unexpected, uninformative, or had a subject line tHaT wAs fOrmAtTeD liKe tHiS, we bet you didn't hesitate to direct them towards the trash, right? 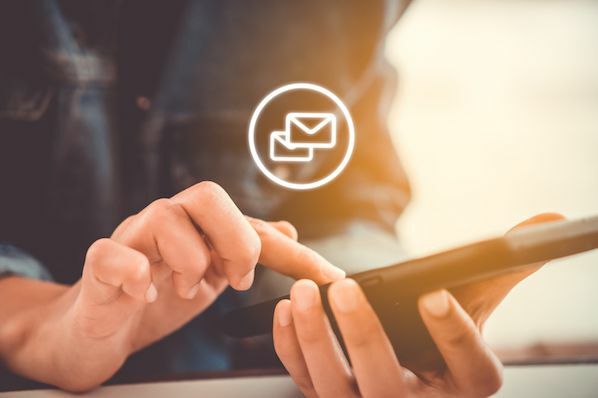 While email has managed to stand the test of time, many marketers have failed to update their strategies since its inception. So to ensure you're sending modern emails that warrant some of your recipients' precious time and attention, we've compiled a list of effective email examples to inspire your next campaign. There are a couple things we love about this email example from PayPal. Not only is the opening copy clever and concise, but the entire concept also reflects a relatable benefit of using the service. Think about it: How many times have you been in a situation where you went out to dinner with friends and then fussed over the bill when it came time to pay? By tapping into this common pain point, PayPal is able to pique the interest of its audience. Great companies are always evolving, and your customers expect to experience change. What they don't expect (because too many companies haven't lived up to this end of the bargain) is to be told about those changes. 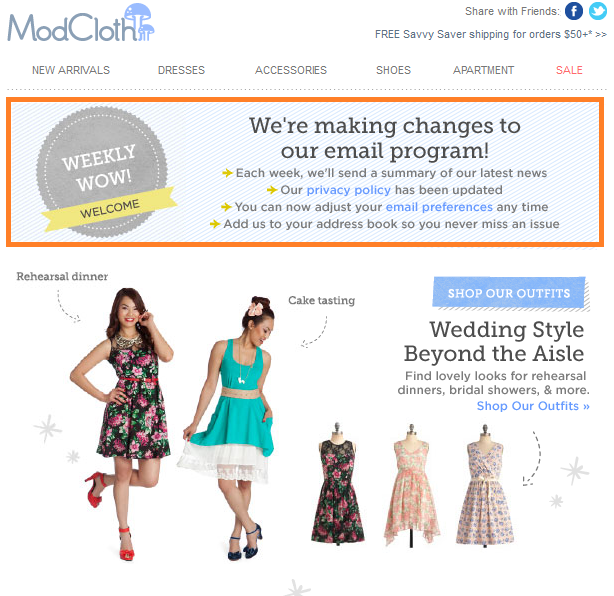 That said, this email from ModCloth serves as a refreshing change of pace. If you're going to change the way you communicate with a lead or customer, give them clear, fair warning so, if they aren't on board, they can make the necessary adjustments to keep their inbox clean. Did you see that? Did you see it move? Pretty cool, right? This small bit of animation helps to separate this email from Tory Burch from all of the immobile emails in their recipient's inboxes. They also leverage exclusivity by framing the promotion as a "private" sale. Often times, this type of positioning makes the recipient feel like they're specially chosen, which encourages them to take advantage of the special opportunity they've been presented with. This example sample comes courtesy of my coworker who started signing up for Zipcar, got busy, and had to abandon the form. As a result, the email calls her back to the website with some lighthearted copy that nudges her in the right direction, and also reminds her of the value of using Zipcar -- being economical and helping the planet. If your site visitors are abandoning shopping carts or landing pages, use your email marketing in this way to remind them they have some unfinished business on your website! 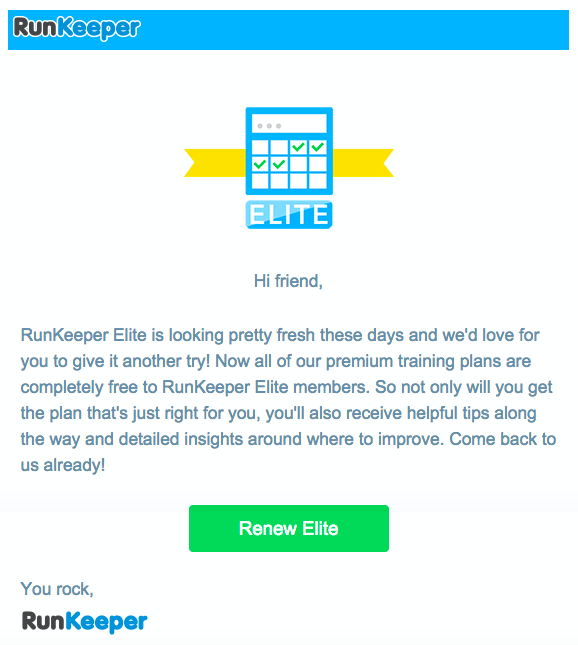 RunKeeper makes an effort to reengage lost users with this friendly, informational email. By highlighting their app's most recent changes and benefits, the copy works to entice recipients to give the app another chance. Small inclusions like the "Hi friend" greeting and the "You rock" closing makes the content feel welcoming and less aggressive. Here's another great example from Litmus of animation being used to create more interesting email marketing design. Unlike static text, the swipe motion used to provide recipients with a look "under the hood" of their email tool is eye-catching and encourages you to take a deeper dive into the rest of the content. Not to mention the header does an excellent job of explicitly stating what this email is about. You've heard it a million times (and a few thousand of those times may have been from us): You should create a sense of urgency with your calls-to-action. That's what makes a lead take action, right? 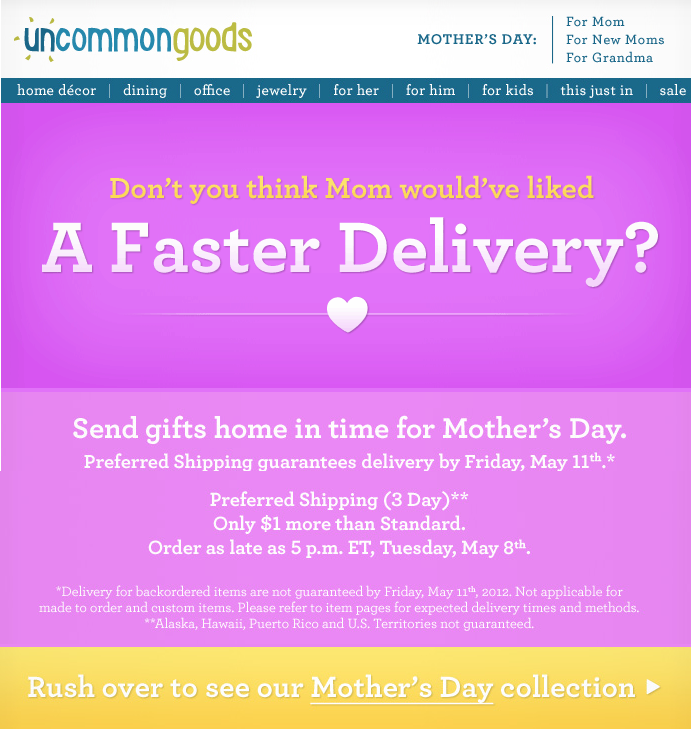 Well, this email from UncommonGoods succeeds in creating a sense of urgency by focusing on the value of acting now. Instead of saying, "Order your Mother's Day gift NOW before Preferred Shipping ends! ", this email asks, "Don't you think Mom would've liked a faster delivery?" Why yes, she would. Thank you for reminding me before it's too late -- I don't want to be in the dog house because my gift arrived after Mother's Day. 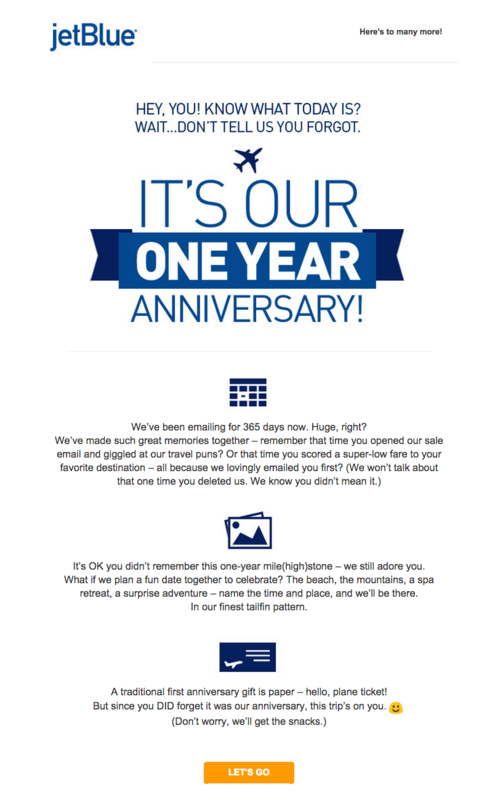 Confession: We have a serious email marketing crush on JetBlue. And they continue to deliver their lovable marketing in this cheeky email campaign that aims to humorously reengage customers. Every element from the header, to the three witty points, to the actionable, contrasting CTA work together to create a lovable campaign that's promotional without being pushy. It's simple: If you want people to engage with your emails, give them a reason to do so. This clean, minimalistic, and easy-to-click email campaign from Bonobos creates an interactive experience that encourages the recipient to take action. 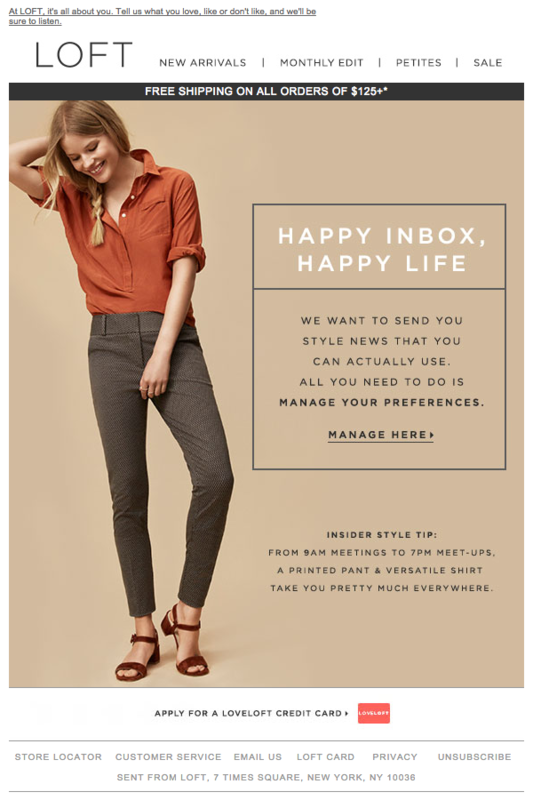 The structure of this email aims to cater to those who don't have time to waste scrolling through pages of shorts that may or may not be in stock in their size. By providing a direct pathway to what they're looking for, Bonobos creates a seamless online shopping experience. This email from Amazon Local is short and sweet, with just one CTA: click through this email to tell Amazon what you like and dislike. That way, the deals they send you going forward can be more in line with what you're likely to actually want. What's wonderful about this experience is not just that they asked, but also how consistent the experience is from email to landing page. Take a look at the email below, and the landing page that follows. 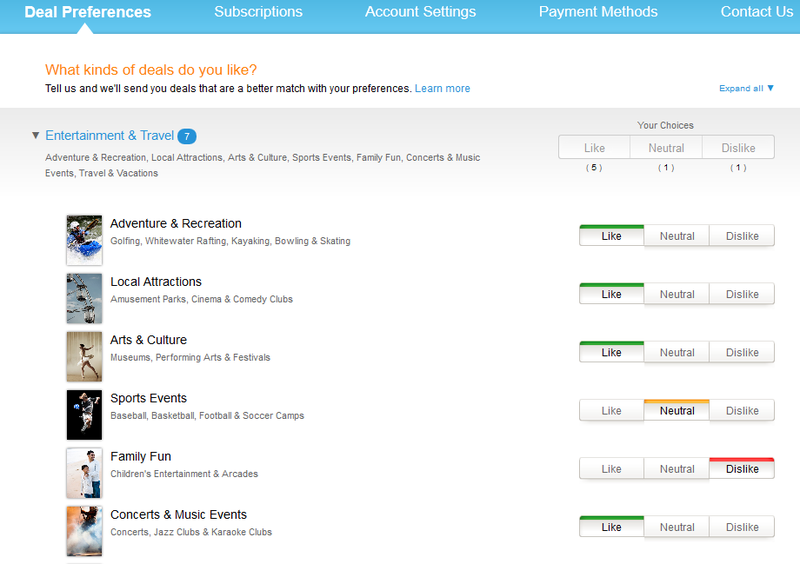 Notice how the language in the email above, "like" and "dislike," mirrors the language in the buttons below? This is a simple way to get feedback from your email recipients to provide more personalized offers in their inbox, thus increasing the chance of a high clickthrough and offer redemption rate. 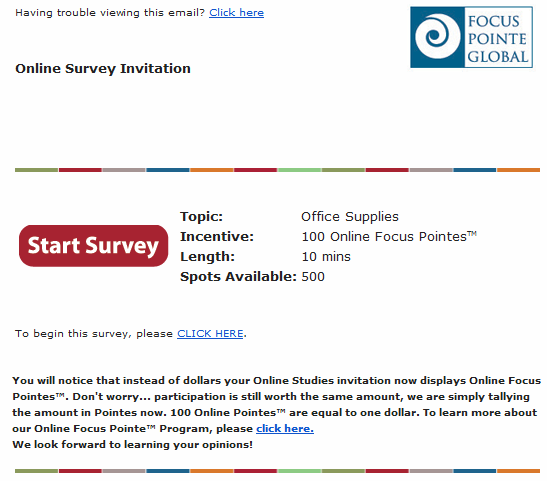 Focus Pointe Global provides focus groups so regular businesses can get some meaty market research. While research is known for being a little complicated, this email is impressively simple. All of the information you need to know to determine whether you want to participate is called out in bold, and extremely short explanatory copy follows it. What is the survey about? What do I get for taking it? How long will it take? Where can I begin? You can figure this all out pretty immediately. All emails should aim to provide such clear instruction. 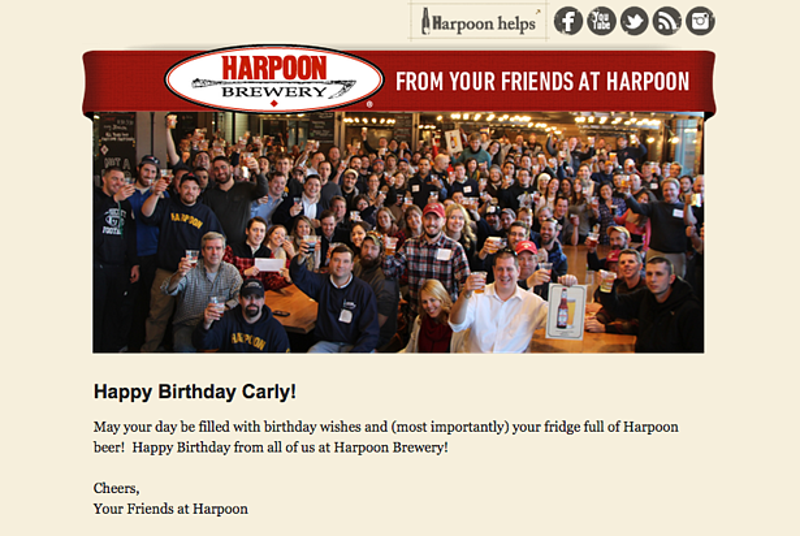 My friends at Harpoon are so thoughtful, aren't they? This simple, timely email really does feel like it's coming from a friend, which is why it's so effective. In an age of email automation, it's easy for email campaigns to feel a little robotic. And while I'm certain that this email was, in fact, automated, it feels really human. If you're looking to strengthen the relationship you have with your existing customers, consider taking the time to set up a quick email like this to let them know you're thinking of them. 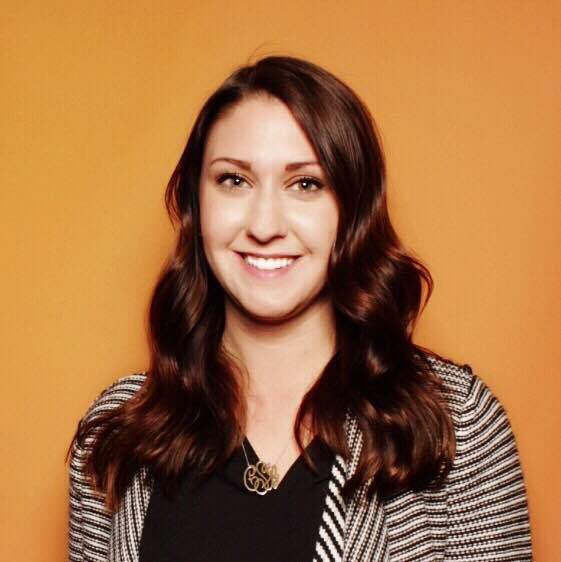 HubSpot customer Bonafide uses this email in one of its lead nurturing email series, and it's a great example of a principle so many email marketers forget. Your inbox recipients don't always remember who you are! 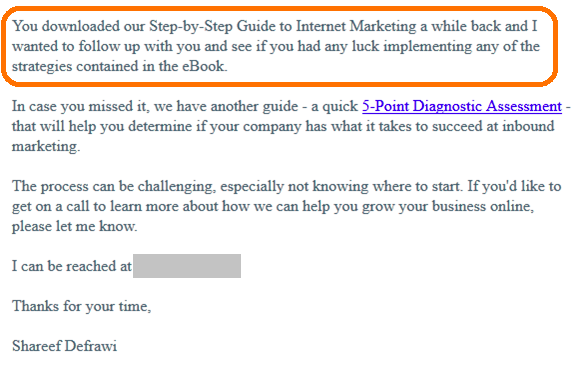 Take a look at the callout in orange -- the first paragraph of this email tells the reader why they are being contacted. With the amount of inbox overload we all suffer, reminders of this nature are critical to preventing deletions and unsubscribes. That's quite powerful, wouldn't you agree? 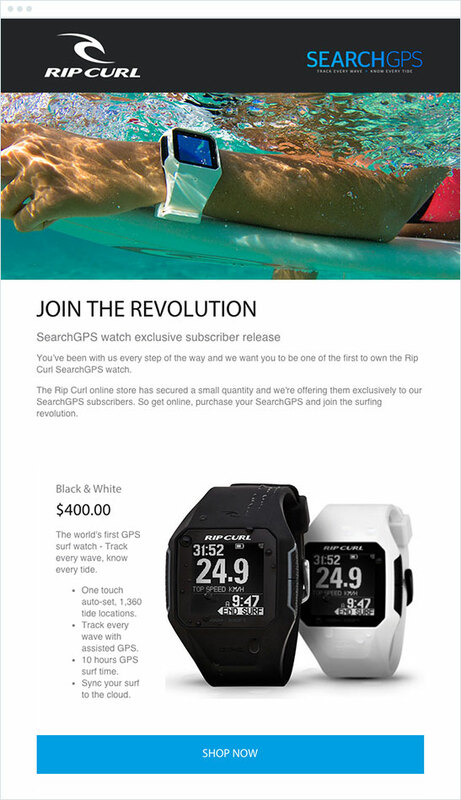 Rip Curl, an Australian surfing sportswear retailer, combines urgency and our psychological need to be part of something to create an email headline that jumps off the page. This positioning is designed to lead people to believe that there's a "revolution" taking place and it's their turn to get in on the action. At the end of the day, people want to be part of something that's bigger than themselves, and this email aims to motivate them to do so by purchasing this sleek watch. For many of us, when it comes to wrapping gifts, the struggle is real. J.Crew Factory recognized this problem, and then created this email to serve as a solution for those incapable of pulling off a Pinterest-esque wrap job: gift cards. The email offers up two different says to pick up a gift card -- in store or online -- in an effort to avoid excluding anyone. They've also included a map of the nearest store location at the end of the email to lower the purchasing barrier even further. There are hundreds of other examples of excellent email marketing. 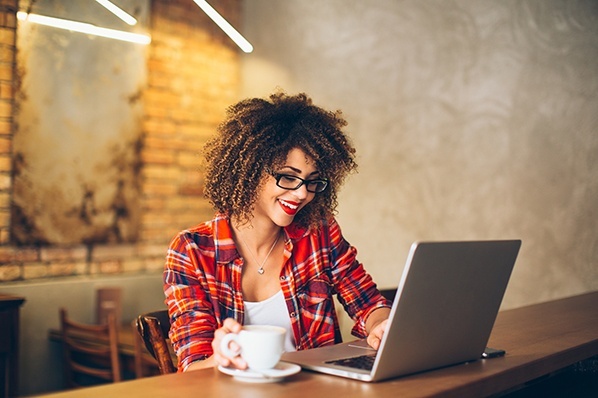 Check out some more of our favorite HubSpot marketing email examples, and share some of your favorite campaigns in the comments.